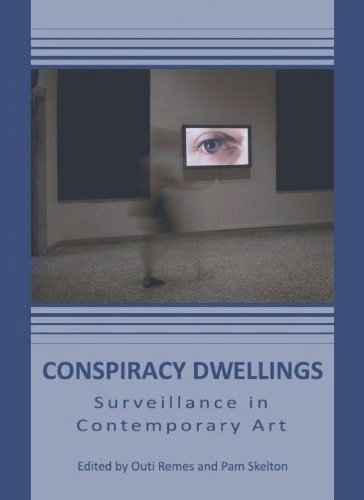 ‘Conspiracy Dwellings: Surveillance in Contemporary Art’ brings together nine illustrated essays of theorists and art practitioners about artworks made in the midst of conflict or from the position of commentary and critique in topics that span from the 70s to the present day. The contributors Anthony Downey, Christine Eyene, Liam Kelly, Verena Kyselka, Robert Knifton, Outi Remes, Maciej Ozog, Paula Roush, Matthew Shaul and Pam Skelton consider the practical and theoretical status of surveillance from a variety of positions that include surveillance and its impact on urban space, architecture, citizenship and civil liberties. These essays also provide the opportunity to consider artworks that address conflict and resistance as a lived experience alongside strategies of counter-surveillance that propose new spectatorial positions, individual empowerment and entertainment. Today, in post 9/11 times of economic difficulties, political uncertainty and suspicion, the subject of patriotism, freedom and democratic rights are once again high on the agenda, raising questions such as where do we draw the line – how far does surveillance have to go before it worries us – and at what point is the citizen regarded as a threat to the state? Chapter authored: The Lives of Others: Artur Zmijewski’s Repetition, The Stanford Prison Experiment, and the Ethics of Surveillance. To purchase a copy of Conspiracy Dwellings: Surveillance in Contemporary Art please follow this link. Downey, Anthony. “The Lives of Others: Artur Zmijewski’s Repetition, The Stanford Prison Experiment, and the Ethics of Surveillance.” Conspiracy Dwellings: Surveillance in Contemporary Art. Ed. Outi Remes and Pam Skelton. Newcastle: Cambridge Scholars, 2010. 67-82.